New Delhi: Marathon runner O P Jaisha on Monday alleged that Indian officials did not arrange for water and energy drinks during her race in the Rio Olympics run under scorching heat despite designated stations being given for the country, a claim denied by Athletics Federation of India. “It was very hot there. I ran in scorching heat. There was no water for us, neither recovery drinks nor food. Only once in 8km did we get water (from Rio organisers) which did not help at all. All the countries had their stalls at every 2km but our country’s stall was empty,” said Jaisha who finished 89th in Rio Olympics women’s marathon event with a below-par timing of 2:47:19. Jaisha collapsed at the finish line after completing the race and had to be rushed to a hospital where her coach Nikolai Snesarev got into an altercation with one of doctors and ended up being detained for half a day by local police. “We are supposed to be given drinks by our technical officials, it’s the rule. We cannot take water from any other team. I saw the Indian board there but there was nothing. I had a lot of problem, I fainted after the race. I was administered glucose, I thought I would die,” she recalled. The runner claimed that she got no response from officials when she asked why water was not provided to her at the stalls. “I asked officials why there was no water for us but I got no response. I don’t know what they were doing. There were lot of people in the Indian athletics contingent, anybody could have done this job. I don’t know where they were. I was in very bad shape. My coach was blamed for misbehaving with doctor but he was told Jaisha has almost died, what could he have done?” she asked. Refuting Jaisha’s claim, AFI said that it was she who refused to avail the option of having energy drinks. “Each team is allowed to keep their own personalised drinks on the booths, marked in a colour as per the choice of the team and athlete. Accordingly, as per the rule, on the night ahead of women’s marathon race, Indian team manager carried 16 empty bottles, eight each for Jaisha and Kavita Raut and visited the duo and their coach Nikolai Snesarev in their room,” the AFI said in a statement. “The team manager asked them to provide their choice of personalised drink which would then be sealed in their presence and handed over to the organisers for installing them on the booth along with a placard as per the requirement of the athlete. “In this case, the two athletes, Ms Jaisha and Ms Raut declined the offer and informed the Indian team manager that they didn’t require personalised drink, and if at all they required it during the race, they would use the drinks available at the water booth and refreshment booth provided by the organisers,” the AFI said. The AFI said that as per rules, an athlete can to be disqualified if he or she accepts a drink from any other person or official standing along the course except taken on their own — be it personalised drink submitted to the organisers in advance or the drinks provided by the organisers on the water and refreshment booths respectively. “Therefore, it is an incorrect statement made by Ms O P Jaisha that the Indian officials accompanying the team did not provide her water or any other form of tonic drinks. The AFI said in the case of three Indian men marathon runners, their coach Surender Singh had requested for personalised drinks for them and the same was provided to them as per their requirement. “The AFI vouches that the arrangement for marathon race organised by the OC 2016 Rio Olympic Games was commendable and as per the rules and regulations pertaining to conduct of a marathon race. “As per the prevailing rules and regulations, the organisers installed one water point per every 2.5km and one refreshment booth per every 2.5km. The quantity of drinks was enough and the Rio organisers did a wonderful job on this front as per requirement for a marathon race. “In addition, the organisers installed one medical booth per every 5km on the marathon course, and two ambulances accompanied the runners – one ahead and one behind the group of marathoners. This was also organised in Rio as per the rules and regulations and there was no reason to complain,” the AFI said. 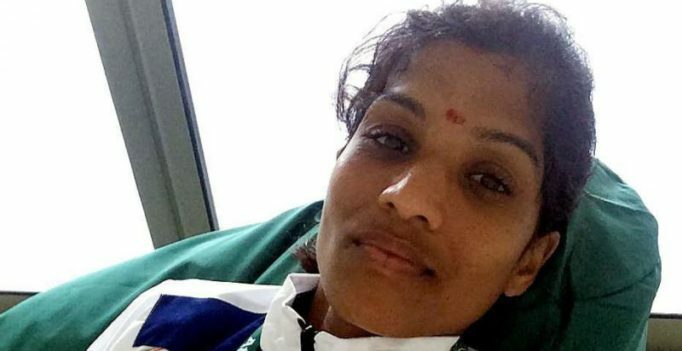 The AFI said that the Rio organisers acted swiftly and provided an ambulance within two minutes after Jaisha had fainted and within no time the Indian team manager and deputy chief coach of the Indian athletics team accompanied her to the hospital. “In fact Dr Nikolai Snesarev out of concern for Ms Jaisha’s health and safety even got into an altercation with a lady from the organising committee and faced time in a lock up for this purpose,” the AFI said. Watch: When Varun Dhawan got off stage to kiss a very special person!